Be tall enough to sit without slouching. Keep his/her back and buttocks against the vehicle seat back. Keep his/her knees completely bent over the edge ofthe vehicle seat. Whether a parent is securing a child in the seat belt or ifthe child is old enough to secure himself, it is important that the seat belt is used correctly. These four key steps must be followed to get the full benefit of the seat beltduring a crash and to reduce the possibility of potential injuries. The child can sit with his or her back against the vehicle seat; knees bend at front edge of seat. The lap belt stays low and tight across the hips andupper thighs. The shoulder belt crosses the center of the chest and collarbone. The head restraint is adjusted properly behind the center of the back of the head. Involve pre-teens in family discussions about safety in all motor vehicles. Teach children that safety belts save lives and that an unbuckled passenger is likely to injure others. Make sure the shoulder belt fits correctly across the center of the chest and collarbone, and the lap belt remains low and snug across the hips/upper thighs, and that good posture is maintained. Teach children to counter peer pressure with the facts. Make sure that other drivers have the same rules as you do and enforce them in their vehicles if car-pooling. Limit the number of passengers you transport to avoid driver distraction. Involve your children in family discussions and setting of “house and car rules”. Discuss who the children are allowed to ride with in a car, when a child should refuse a ride, and that buckling up is required. Seat belts are designed so that the strongest areas of your body – the bones of your hips, shoulders and chest, absorb the forces in a crash. 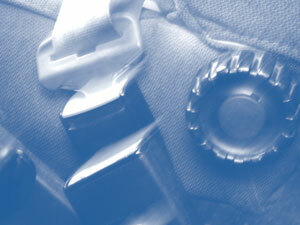 Seat belts prevent you and other occupants from being thrown around the vehicle and against each other. Seat belts provide the greatest protection against ejection from the vehicle in the event of a collision. Wear the lap/shoulder belt adjusted low across the hips and pelvis, and the shoulder belt across the chest and shoulder. Sit upright with your back to the seat. Read both the car seat instructions and the vehicle owner’s manual before installing car seats. When installing your child’s car seat, place your weight on the car seat. Lock the seat belt according to the vehicle’s instructions on the seat belt or in the owner’s manual. Check the installation and allow no more than one inch of side-to-side or forward movement. Infants should ride rear facing and semi-reclined to no more than 45 degrees, until at least age 1 and 20 pounds. The American Academy of Pediatrics recommends keeping children rear-facing to the highest weight or height allowed by the child safety seat’s manufacturer. Remember, NEVER place a rear-facing infant in front of a passenger side air bag. Place the harness in the slots at or below the shoulders. Tighten the harness until it lies in a relatively straight line without any slack or sagging, but not so tight as to press into the child’s body causing discomfort. Adjust the chest clip on the harness to armpit level (if manufacturer provides one). NHTSA recommends all children who have outgrown child safety seats should be properly restrained in a booster seat until they are at least eight years old and approximately 4 feet, 9 inches tall. Use the belt positioning booster seat with a lap and shoulder belt properly adjusted to fit a small child over the hips and shoulder. For children age eight through adult, it is important to use a properly positioned seat belt. 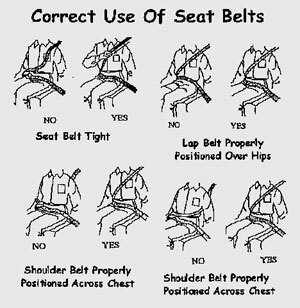 Properly positioned means that the shoulder belt is across the shoulder and the lap belt is low and snug across the hips. NEVER place a shoulder belt behind the back or under the arm. BUCKLE UP EVERY TIME, EVERY RIDE!